Packing up for a holiday is normally a fun time filled with great expectations for the time ahead. This time is as well a challenging period for bulldog owners who don't want to leave their bulldog behind. Most dogs including French bulldog love to go on an adventure, and traveling with their owners makes it even more fun for everyone! It is in their nature to travel around new places and meet new people. For this reasons owners of bulldogs would much rather travel with their dogs and enjoy their time together. With good preparation, you can make traveling with your French bulldog a very rewarding experience without stress or anxiety. If you decide that you and your best friend will stay together and travel together, then here are some tips to make your journey safer and easier. Good preparation will involve preparing proper documentation for the dog. This involves getting your dog a certificate of health showing that the dog has received the necessary vaccination and is fit enough to travel. Due to the health concerns of the bulldog, a check-up is necessary before you leave. Always make sure that your dog has his collar on. This collar should have his identification tag and contact details to call in case you two get separated. Bulldogs are prone to allergies which are either environment or food related. For this reason, if you are trying out a new food, don't just offer it to your dog to eat especially if you do not know what it contains. Pack some of his food, that way when you are having your meal, you can feed him his. It is necessary to buy a good carrier with good ventilation and as comfortable as possible for your dog, If possible the air conditioned crate. Remember French bulldogs are very vulnerable to heat and you should keep checking your dog to ensure he's alright, also the carrier should be high enough so that your dog can move, stand, turn and lay down, particularly if it’s a long trip. If on the flight, upon your arrival they will specify where you can pick up your French bulldog. When you’re in an area where you can already take him out, do it gradually so he can also land and walk a little. Sure after hours of flight, he will be very glad to see you. Maybe the day of arrival he´ll act a little strange, that is not very lively and even when you are at home he won´t want to eat, but it´s acceptable to give him fresh water and let him relax. Little by little he will get used to the new surroundings. 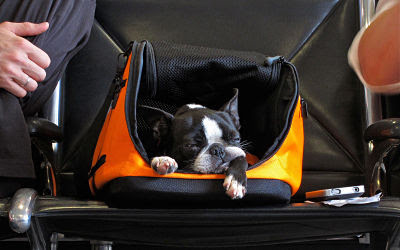 Prepare your French bulldog for travel with his carrier. Meaning, If your bulldog is not familiar with pet carrier or it is new, motivate him to go in, you can push some goodies inside, his blanket or a toy so he gets familiar with the carrier. A few hours to the trip you can leave him inside the carrier to get used to it, the first day 15 minutes, the second day half an hour… little by little he´ll be comfortable. This way you are training for the trip, however, it all depends on individual dogs, there are dogs that carry it well and others that unlikely it is a bit harder. It is important to be a good neighbor when traveling with your bulldog this means that as you travel or enjoy a swim on the beach you are responsible for your dog. If your dog makes any mess, be quick to clean it up and do not be rude when doing so. Yes, dogs need to eliminate, but as a responsible owner, it is your duty to ensure that your dog does so in the right place. On the day of your traveling, it is important to prepare your French bulldog. It is recommended that your bulldog travels on an empty stomach or partly empty, so if he gets dizzy he won’t throw up and he won´t be worse. Try to feed your bulldog enough the day before the trip, because nothing will happen if he stays a few hours without eating. You can also give drinks before traveling but not excessively. Going with your French bulldog on a journey can be a fun encounter for you both. Once you have taken one journey with your bulldog, hopefully, you will need to take him on every voyage. Your dog will love exploring new places and spend time with you. By following the tips above you can ensure that your trip with your bulldog is fun and free for both of you. Tips for Traveling With a Bulldog.